The Summer is the festival period in Japan, and this is specially true in and around Kyoto. There are so many festivals and events, it is difficult to choose which one to attend. Akiko has chosen a very special one, not well known, and visually quite impressive — the Matsu-age Fire Festival. The location is Hanase, a small village about 25 km up north of Kyoto. As the festival starts late, one has to plan transportation to be able to return to Kyoto when everything is over. We selected a special tour bus (Kyoto Bus) coming from Demachiyanagi station. We left just before 6 pm and arrived there a bit after 7 pm. It was already night. The event was to start around 9 pm. This village is located in the middle of the mountains. The road that leads to it is very narrow and quite dark, with very sharp turns. After getting off the bus, we followed the other people and crossed a small bridge. There were already a lot of people lining up the road, all of them with tripod and camera. Most were quietly seated, waiting. We found a nice little spot to place our gears and install ourselves. We couldn’t see much, except for a bunch of torches planted on the other side of the river, surrounding a 20 meter high Japanese cypress log with a large torch placed on top. We waited like this, wondering what was going to happen, for well over one hour. A couple of men, wearing traditional cloth, then arrived along the road with a torch alight. They met other men similarly dressed, and all of them, carrying torches on fire, returned to the bridge, crossed the river and started to light the numerous torches planted around the pole. The event was starting. 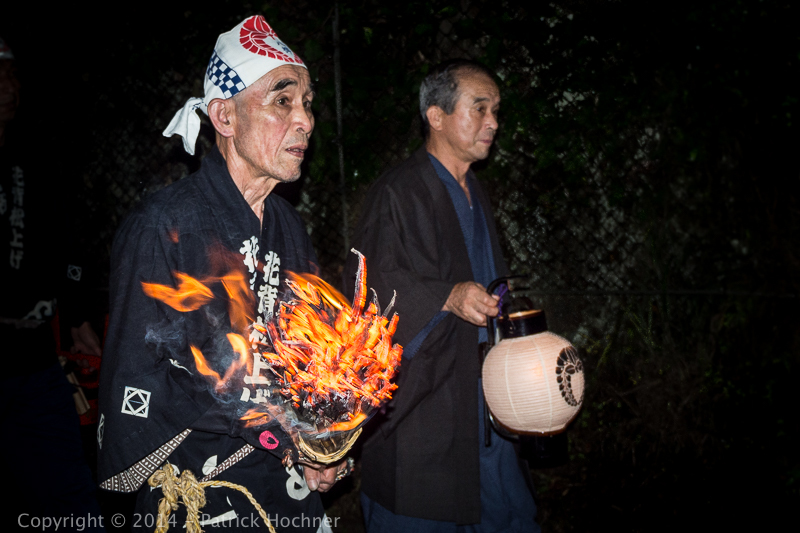 These local men took small torches attached to lengths of twine (called “Agematsu”), lighted them in the bonfire, and hurled them up at the torch located at the top of the pillar, trying to set it alight, all to the slow tune of drumming. It took them a few trials before the fire started at the top of the pillar. Each time a small Agematsu almost reached the torch, people applauded, cheered and commented (ala, hoshii!) After a little while and a few direct “hits”, the top torch was on fire. It started raining and we headed back toward the bus. Just before we reached it, the festival reached its climax with the fire growing enough to send the whole tree-torch crashing to the ground! It was now raining hard and time to return to Kyoto. This countryside tradition highlights some of the more rural areas of Japan. The Matsuage Torch Lighting festivals are held in three outlying cities in Kyoto. It was originally a ritual undertaken to commemorate local fire deities, honor the dead, pray for good crops and ward off fires.